It's been a little while since I've posted anything here on the blog, but I've had so much going on (really good stuff!) 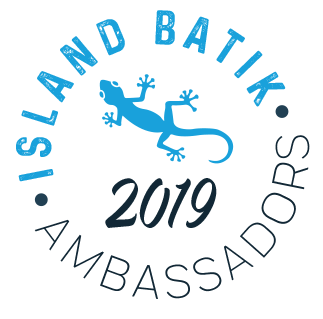 and am excited to share some of that with you! I love my most recent finish so much, and I know my mom (the recipient) does, too! Don't worry....there are lots of pics included because I know that's what you really want to see! I finished this mini quilt for my mom for Mother's Day. She's really hard to buy for (although she says she doesn't really need or expect anything) so I like to make her something when I can. I was born in Charleston, SC, and lived just outside of Charleston until I got married (a long time ago). My mom still lives in the area, as do a lot of other family members, so I still get to visit the area occasionally. 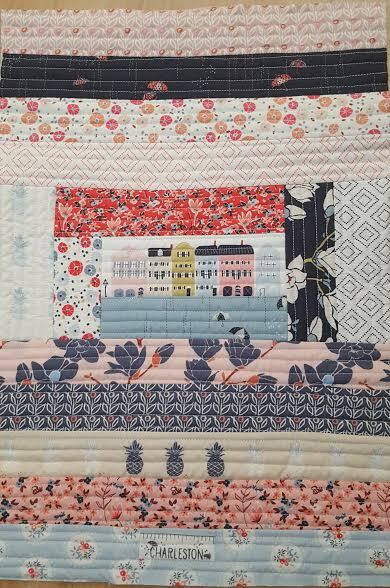 In the past, I've cross-stitched some Charleston-themed gifts for her, which she loves, so I knew she would really like something made with the new Charleston fabrics by Amy Sinibaldi by Art Gallery Fabrics. I ordered mine online from Winter Creek Cloth one morning, and it was on my doorstep that afternoon! Ha ha! My friends Dana & Lynn own the shop, so that's pretty convenient! Since I waited until the last minute (as usual) to decide what I wanted to make, I knew it needed to be fast, so NO paper piecing! 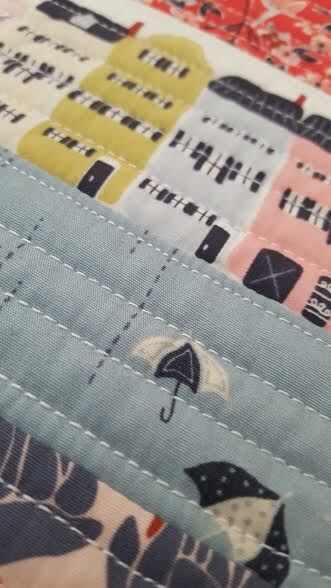 I decided to use this improv pillow tutorial from Quilting in the Rain as inspiration for a mini quilt to hang on the wall. 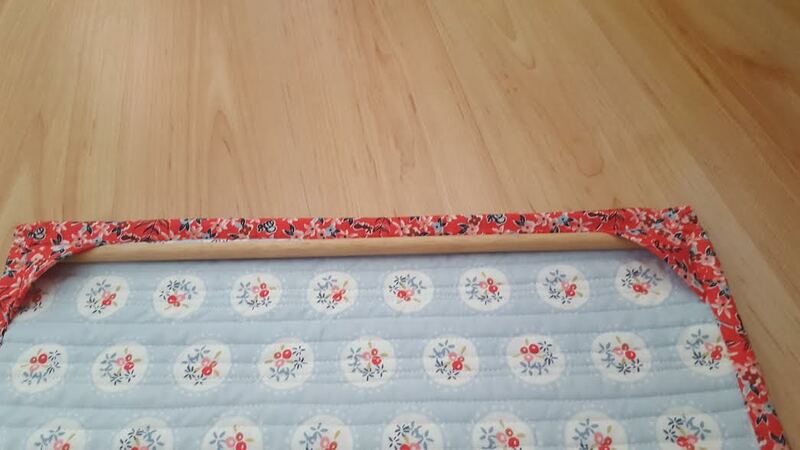 It's about 12" x 18" and can easily hang on nails using a dowel placed in corner pockets (scroll down for pic). Look at all of these fabrics....SO sweet! I used 50 wt Aurifil thread for the piecing and 40 wt Aurifil for the quilting. I used this tutorial from Crazy Mom Quilts for binding tiny things. 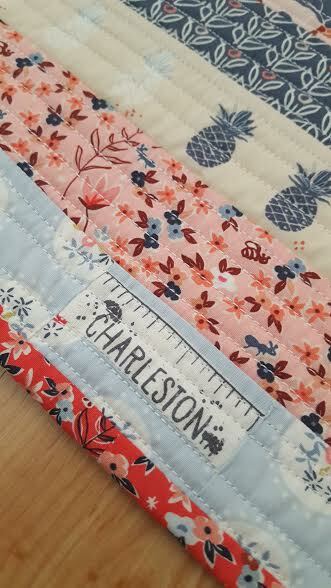 I even cut the "Charleston" out of the selvedge to use as part of the quilt! 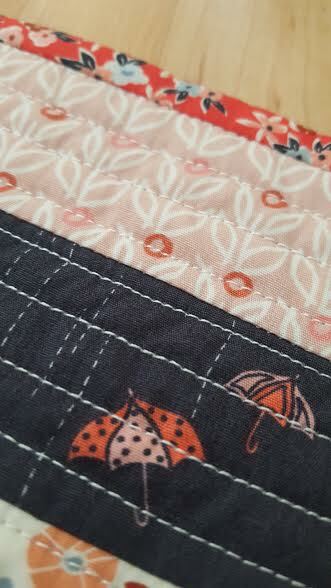 I used another tutorial from Crazy Mom Quilts as inspiration for making a card using some of the fabric. I have more to share with you, but I'll save it for another post. I'm determined to start blogging regularly again. 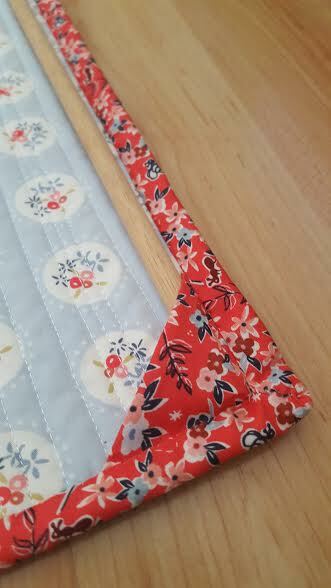 I've really been thinking about why I started blogging in the first place - to document my quilting - to tell my story. So, that's what I'm going to do...again. And I still enjoy reading blogs, but I've been making an effort to actually start commenting again. 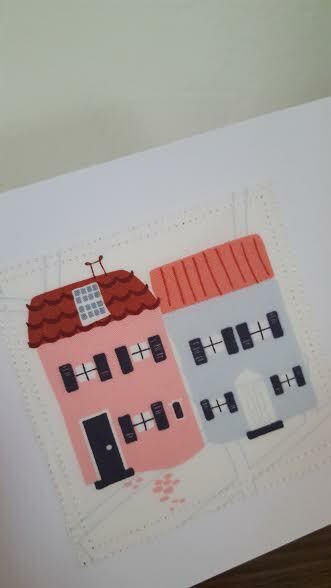 Stay tuned and happy quilting!